^ covalent bond - IUPAC. Compendium of Chemical Terminology, 2nd ed. (the "Gold Book"). Compiled by A. D. McNaught and A. Wilkinson. Blackwell Scientific Publications, Oxford (1997). XML on-line corrected version: http://goldbook.iupac.org (2006-) created by M. Nic, J. Jirat, B. Kosata; updates compiled by A. Jenkins. ISBN 0-9678550-9-8. doi:10.1351/goldbook.C01384. ^ March, Jerry (1992). Advanced organic chemistry: reactions, mechanisms, and structure. John Wiley & Sons. ISBN 0-471-60180-2. ^ Gary L. Miessler; Donald Arthur Tarr (2004). Inorganic chemistry. Prentice Hall. ISBN 0-13-035471-6. ^ Merriam-Webster – Collegiate Dictionary (2000). ^ Langmuir, Irving (1919年6月1日). 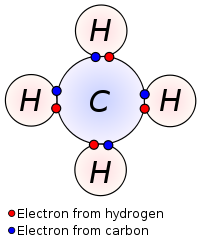 “The Arrangement of Electrons in Atoms and Molecules”. Journal of the American Chemical Society 41 (6): 868–934. doi:10.1021/ja02227a002. ^ Lewis, Gilbert N. (1916年4月1日). “The atom and the molecule”. Journal of the American Chemical Society 38 (4): 762–785. doi:10.1021/ja02261a002. ^ W. Heitler and F. London, Zeitschrift für Physik, vol. 44, p. 455 (1927). English translation in Hettema, H. (2000). Quantum chemistry: classic scientific papers. World Scientific. pp. 140–. ISBN 978-981-02-2771-5. https://books.google.com/?id=qsidHRJmUoIC 2012年2月5日閲覧。. ^ Stranks, D. R.; Heffernan, M. L.; Lee Dow, K. C.; McTigue, P. T.; Withers, G. R. A. (1970). Chemistry: A structural view. Carlton, Victoria: Melbourne University Press. p. 184. ISBN 0-522-83988-6. ^ Weinhold, F. and Landis, C. (2005). Valency and bonding. Cambridge. pp. 96–100. ISBN 0-521-83128-8. ^ Cammarata, Antonio; Rondinelli, James M. (2014年9月21日). “Covalent dependence of octahedral rotations in orthorhombic perovskite oxides”. The Journal of Chemical Physics 141 (11): 114704. doi:10.1063/1.4895967. ^ F. Hund (1926年). “Zur Deutung einiger Erscheinungen in den Molekelspektren" [On the interpretation of some phenomena in molecular spectra]”. Zeitschrift für Physik 36: 657-674. ^ F. Hund (1927年). “Zur Deutung der Molekelspektren: Part I”. Zeitschrift für Physik 40: 742-764. ; Part II, (1927) 42, 93–120; Part III, (1927), 43, 805-826; Part IV, (1928), 51, 759-795; Part V, (1930), 63, 719-751. ^ R. S. Mulliken (1927年). “Electronic states. IV. Hund's theory; second positive nitrogen and Swan bands; alternate intensities”. Physical Review 29: 637–649. doi:10.1103/PhysRev.29.637. ^ R. S. Mulliken (1928年). “The assignment of quantum numbers for electrons in molecules”. Physical Review 32: 186–222. doi:10.1103/PhysRev.32.186. ^ Werner Kutzelnigg (1996年). “Friedrich Hund and Chemistry”. Angewandte Chemie International Edition 35: 573–586. doi:10.1002/anie.199605721. ^ Mulliken, Robert S. (1967年). “Spectroscopy, Molecular Orbitals, and Chemical Bonding”. Science 157 (3784): 13-24. http://nobelprize.org/nobel_prizes/chemistry/laureates/1966/mulliken-lecture.pdf. ^ Lennard-Jones. J. E. (1929年). “The electronic structure of some diatomic molecules”. Transactions of the Faraday Society 25: 668-686. doi:10.1039/TF9292500668. ^ a b c P.W. Atkins (1974). Quanta: A Handbook of Concepts. Oxford University Press. pp. 147–148. ISBN 0-19-855493-1.